A new poll released by the NAACP indicates that President Donald Trump’s approval rating is dropping amongst all voters of color and the country’s most competitive races during mid-term elections in November may hinge on his racism. The African American Research Collaborative (AARC), a research and polling firm dedicated to understanding and communicating Black political action, conducted the poll for the NAACP. The NAACP took the poll due to the importance of this year’s election to Blacks, people of color in general, and to all Americans, according to NAACP President Derrick Johnson. Researchers oversampled African Americans, Whites, Latinos, Asian Americans, and Native Americans in 61 districts. In all they interviewed 2,045 registered voters. They found that Democratic candidates hold a 13 point advantage over Republican candidates in the House race among all voters, with differences by race/ethnicity. The tally was 51 percent to 38 percent with 11 percent undecided. Researchers also found Trump’s approval numbers are underwater for all voters of color, and for no racial/ethnic group of voters surveyed does he have majority approval. “The last presidential election was the first presidential election without the full protection of the Voting Rights Act and today we see some of the consequences with the massive voter purging that’s taking place in many states across the country,” stated Johnson during a media tele-briefing announcing findings of the poll, released August 7 - a day before the 53rd anniversary of the Voting Rights Act, which guaranteed Blacks the right to vote. “In this poll, we see that Americans, especially communities of color, believe that Trump is taking our country backwards on race relations and halting progress of communities of color,” Johnson continued. 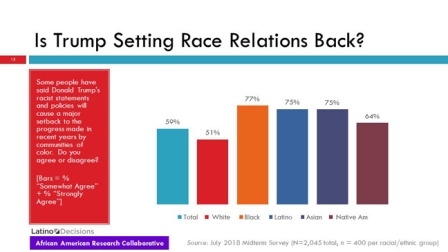 Specifically, the poll indicates that three quarters of Blacks,, Latinos and Asian Americans believe Trump is setting race relations back while a small majority of White voters believe so. 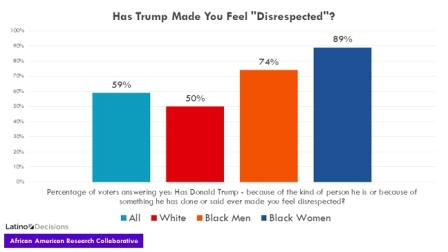 “Black women (89%), in particular, feel disrespected by President Trump. This is a likely contributor to why African American women voters have had high turnout in recent off year and special elections – witness Alabama and Virginia,” the poll further indicates. Lack of voter engagement also surfaced through the poll. Large majorities of voters of all racial and ethnic groups in the most competitive House districts reported they have not been contacted by anyone from a campaign, political party, or community organization to ask them to vote or register to vote. “… our analysis shows that Trump’s racist statements and actions, which include many policies like separating children at the border, will likely be major factors in both people turning out to vote in this mid-term election and how they will vote,” Johnson stated. Professor Ray Block, Jr., University of Kentucky, AARC and Latino Decisions, a Latino political opinion research effort, delved further into the July 2018 mid-term survey. In addition to their attitudes about Trump, researchers questioned voters on their views about immigrants and immigration. “Racial animus was used to mobilize voters in 2016, and the evidence from this poll shows that the backlash against racial animus could be used to mobilize African American voters,” stated Block. In all of their polling, Blacks are some of the strongest supporters of immigrant rights, according to Henry Fernandez, co-founder at the AARC. He noted that the family separation issue, in particular, generates strong reactions from Black voters. “This is quite possibly because African Americans have our own historical context for government enforced taking of children,” Fernandez stated. Of note, he went on, in AARC’s polling in the Virginia governor’s race where Democrat Ralph Northam defeated Republican Ed Gillespie, political ads that associated immigrants with criminals were most distasteful to Black voters over all other groups. In the run-up to the mid-term elections, it is critically important to deeply engage with voters in communities affected by what’s coming out of the Trump Administration and the highest halls of power in Congress, urged Jamal R. Watkins, NAACP vice president of Civic Engagement. The NAACP is focused on registering new voters across the country to ensure all eligible votes will be counted in the mid-terms, and then pivot those into full participation during the presidential elections. The NAACP’s goal in part is to ultimately increase voter participation of those who feel disenfranchised.